Babylon's Burning is a near-future, post-apocalyptic skirmish game combining a gritty, atmospheric setting with rules that are both easy to learn and highly realistic. The year is 2025 - 10 years after the Hit, the catastrophic meteor impact that tore society apart and set in motion a chain of events that left cities in ruins and 95% of the world's population dead and buried under a blanket of dust and ash. The survivors have banded together for mutual protection, resources are scarce and every other group is either a threat or an obstacle. The background of the Babylon's Burning game is it's core - not a few paragraphs tagged on to the rules as an afterthought. You're introduced into the game with an extensive history of the Hit and an overview of the world of 2025 and drawn in further with the extensive fiction and the beautifully rendered and atmospheric original artwork that appears throughout. The game mechanics are detailed but intuitive. This is a skirmish level game suitable for anything from a handful of troops to forty or so miniatures per side. Squads, solo elements (officers, snipers, medics and runners) and support weapons move according to a variable initiative system - there is no waiting around twiddling your thumbs while your opponent moves their entire force and the system is perfect for games with more than 2 players. While it uses a fictional setting, Babylon's Burning recognises the realities of modern combat. In order to come out on top, players need to keep moving, pick their targets well, take advantage of suppression and, most of all, utilise the terrain of tomorrow's shattered cities. This is a game that rewards players who ask themselves "what would I do?" - pushing blindly forward in tight formations is a good way to get very dead, very quickly. The game accommodates a wide selection of faction types - Enclaves, Street Gangs, Mercs, Scavs, Ghouls, Culties, Mobs and Syndicates - all of them complete with their own restrictions and advantages. These factions don't just look different; they play differently too. From well armed Enclave militia built around a crack corps of pre-Hit professionals to street kid gangs moving about the table with dizzying speed on skateboards and roller blades, Babylon's Burning allows the player to choose the faction that best reflects their style of play. "The first thing to strike me was the very well produced and laid out format…the rules themselves are well thought out [with] plenty of examples interspersed in the text [and] are framed by an engrossing piece of fiction. The best point of the rules is simply the fact that they are generic in their outlook - they are intended for use with any figures on the market, so they are not bound to a specific company's miniatures. This is a bonus, because you can use any figures you want, unlike some systems that insist on the sole use of 'official' figures." "The background material is very plausible and I think well researched as to the possibilities of this occurrence actually happening. I’ll not go into details about the background but lets just say it is indeed refreshing from the old nuclear exchange routine and I do think quite believable. Gives a multitude of campaign and scenario options…the gaming possibilities are endless and I have admiration for these guys for the concept being a quite in depth look at what could happen in the near future, and I surmise a lot of thought and research must have gone into the whole planning of the background." "We've been playing it, and loving it. The game is complex, detailed and easy to learn." 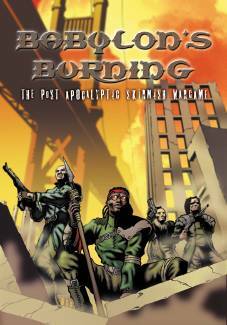 "Well produced and nicely laid out...the rules are supplied with a hefty set of appendices detailing the various forces that battle within the futuristic world of Babylon's Burning. There is no need to go out and buy an army book. There is plenty of choice here to keep you interested."